When I first decided to divide my fall posts into flowers, foliage, and fruits, I chose to leave the fruits for last, figuring that I’d have several more weeks to capture the bounty of berries and seedheads. 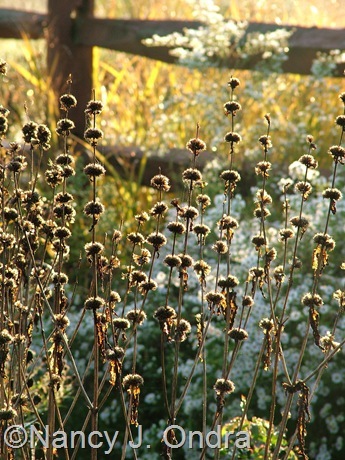 Unfortunately, the unusual cold and snow event at the end of October flattened much of the garden and meadow, bringing the 2011 gardening season to a screeching halt. That was disappointing, of course, but since then, a new twist to this topic has come to mind. I still have some autumn shots to share, but after them, I’ll reveal the new point of this post. 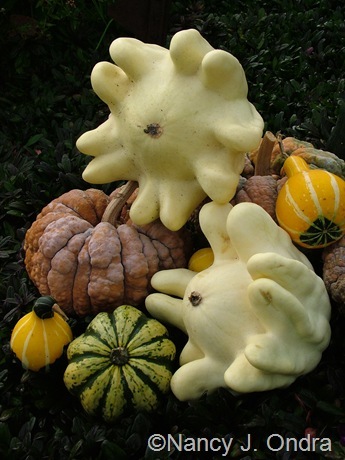 Above, a couple of Yugoslavian finger fruit squash (the white ones) with ‘Black Futsu’ squash (the orange pumpkin-like ones), ‘Carnival’ acorn squash (the green-and-white one), and a couple of yellow-and-green gourds from a mix of seeds. Some perennials here, including blackberry lily (Belamcanda chinensis), above, and ‘Amazone’ tuberous Jerusalem sage (Phlomis tuberosa), below. I think this one has appeared in pretty much every post here since June. Japanese burnet (Sanguisorba tenuifolia) – above – has appeared quite often too, but it’s just so interesting that it’s hard to resist. I’ve amassed a ridiculous number of ironweed (Vernonia) seedhead pictures over the years, yet I couldn’t resist taking more this fall. 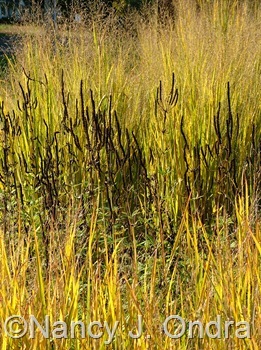 Culver’s root (Veronicastrum virginicum) seedheads – above with the bright yellow fall foliage of ‘Northwind’ switch grass (Panicum virgatum) – are also fun to photograph. Below, the developing seedpods of ‘Oakhurst’ pineapple lily (Eucomis comosa). I have loads of shots of Arkansas bluestar (Amsonia hubrichtii) in fall color, but I never thought to take pictures of the seedheads before. That might be because I usually cut the plants back by half after flowering to make the plants bushier, which means that they don’t set seed. I left the clumps in the shrubbery untrimmed this year, so there are lots of seeds. 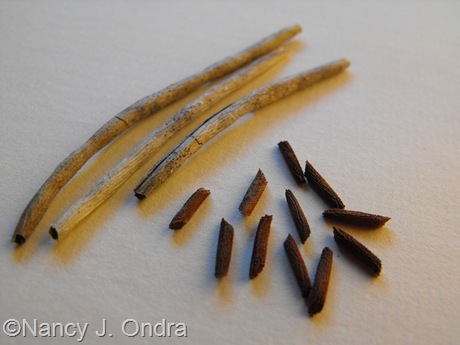 The seedpods aren’t all that interesting, but the stick-like seeds are distinctive. 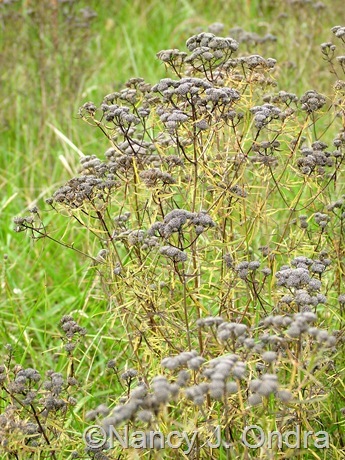 There is (or rather, there was) lots of seedhead action out in the meadow. Above is round-headed bush clover (Lespedeza capitata); below, butterfly weed (Asclepias tuberosa). Above, wild quinine (Parthenium integrifolium); below, narrow-leaved mountain mint (Pycnanthemum tenuifolium). 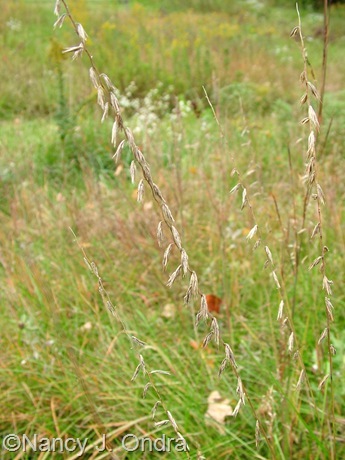 Above, hemp dogbane (Apocynum cannabinum); below, sideoats grama (Bouteloua curtipendula). Back in the garden, a seedpod (boll) of black-leaved cotton (Gossypium herbaceum ‘Nigrum’), above. 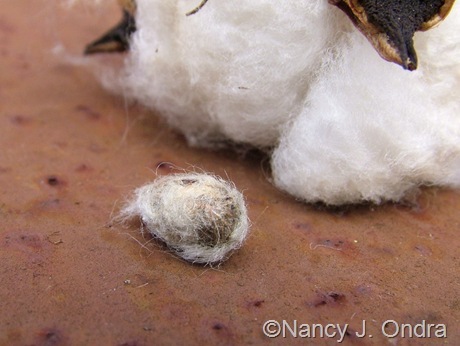 This isn’t the kind of cotton commonly grown for fiber (that’s G. hirsutum), but it does have long white fibers surrounding the seeds. 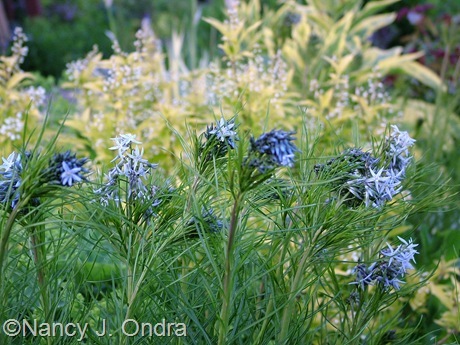 Amsonia hubrichtii (Arkansas bluestar): I like this perennial best for its outstanding fall foliage color, but it’s lovely in bloom too. I’ve blathered on about this plant at length here: One Plant, Three Seasons: Amsonia hubrichtii. 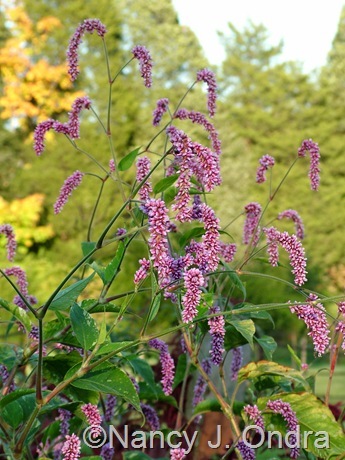 Amaranthus gangeticus ‘Elephant Head’ (amaranth): You need only a few of these to make a real statement in your garden. (I’ll leave it to you to figure out what that statement might be.) 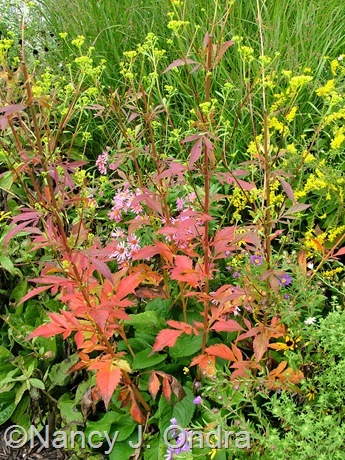 Read a bit more about it here: Three Neat Plants – Mid-September. 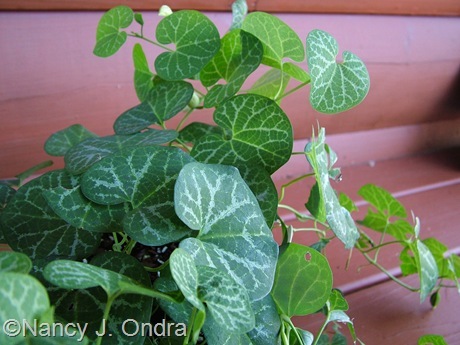 Aristolochia fimbriata (white-veined Dutchman’s pipe): Much smaller than other species, this beauty looks terrific trailing out of a hanging basket or used as a small-scale groundcover. It’s not hardy here in mid-Zone 6 but grows quickly and flowers the first year, so it makes a unique annual. You can read a bit more about it here: Three Neat Plants. 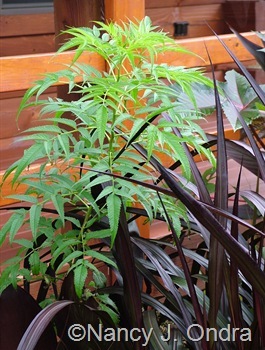 Datisca cannabina (false hemp): It’s tall and it’s basically all green: not a “wow” plant, but I quite like having it around. 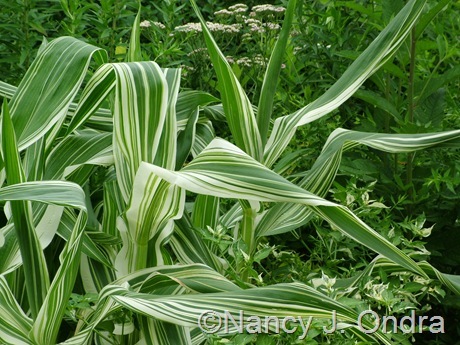 Read more about it here: Three Neat Plants – Mid-August. Dianthus barbatus ‘Black Adder’ (sweet William): A biennial with deep red leaves in cool weather, plus especially dark blooms. A must-have if you’re a fan of “black” flowers (or of Rowan Atkinson). Eucomis comosa from ‘Oakhurst’ (pineapple lily): Marginally hardy for me in mid-Zone 6, this bulb produces long, strappy leaves and broad spikes of pinkish flowers in summer. 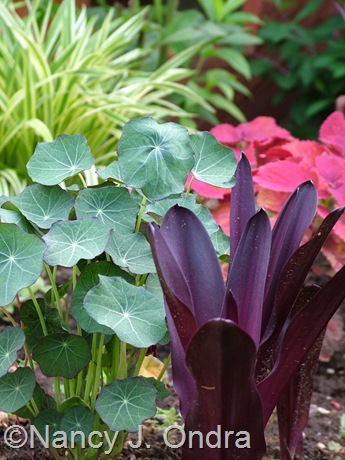 ‘Oakhurst’ has deep purple new leaves that eventually turn purplish green. You can read more about it here: Three Neat Plants. 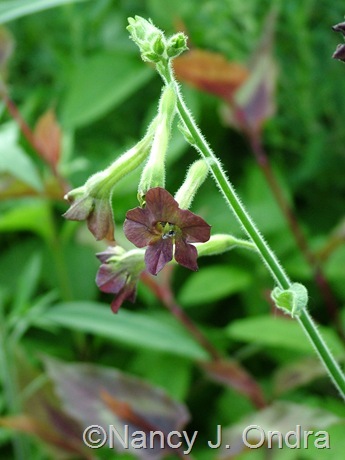 The seed produces about 2/3 purple-leaved seedlings and 1/3 green ones. 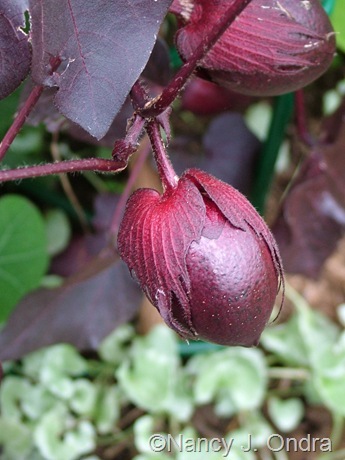 Gossypium herbaceum ‘Nigrum’ (black-leaved cotton): I showed the seedpod earlier in this post, and the pink flowers are very pretty, but you’ll grow it for the super-dark foliage. 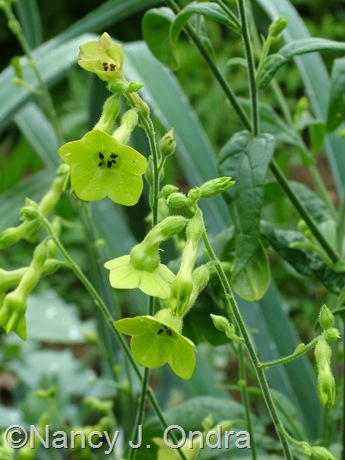 Nicotiana “Ondra’s Brown Mix” (flowering tobacco): Over the last few years, some browns have crept into my original “Ondra’s Green Mix”. These usually reach about 3 feet tall. 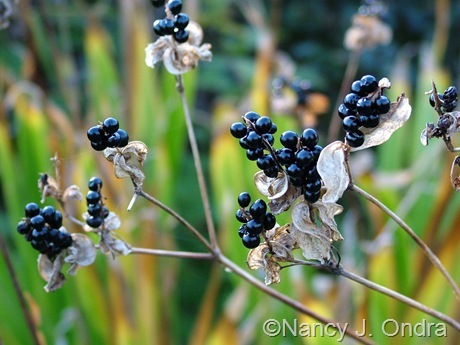 I collected these seeds from the brown-flowered plants, but some green ones may pop up too. 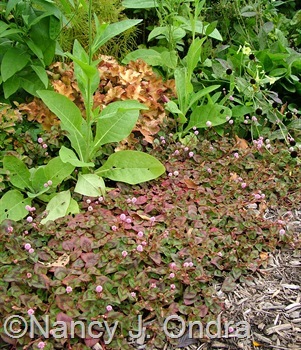 I also have a small amount of “Ondra’s Green Mix” seed (collected from green-flowered plants but may produce some browns). 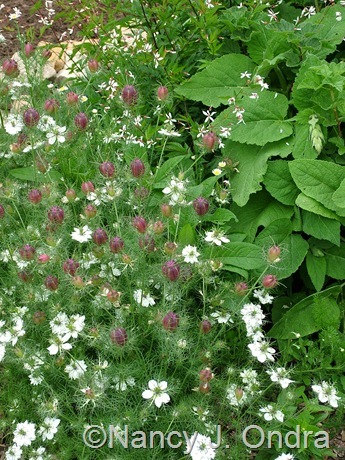 Nigella damascena ‘Cramer’s Plum’ (love-in-a-mist): An easy annual with white flowers that turn into deep plum-colored seedpods. Patrinia scabiosifolia (golden lace): One of my all-time favorite perennials: tall-stemmed umbels of clear yellow flowers from August to October, plus orange-to-red fall foliage color. There’s more info here: Three Neat Plants – Mid-August. 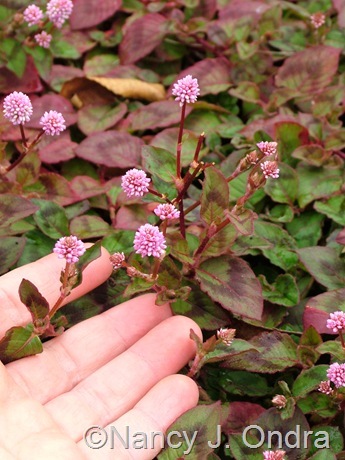 Persicaria capitata (pink knotweed): A cute ground-hugging annual with ball-shaped, pink blooms. 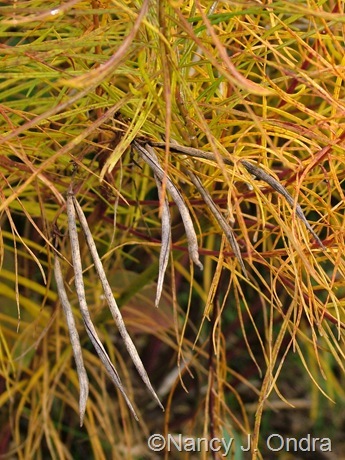 You can find more details here: Three Neat Plant – Early October. 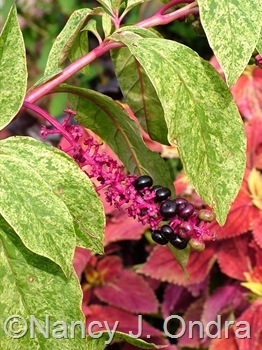 Persicaria orientalis ‘Shiro-gane Nishiki’ (variegated kiss-me-over-the-garden-gate): An eye-catching annual that can reach over 6 feet tall, with large cream-splashed leaves and dangling pink chains of flowers. 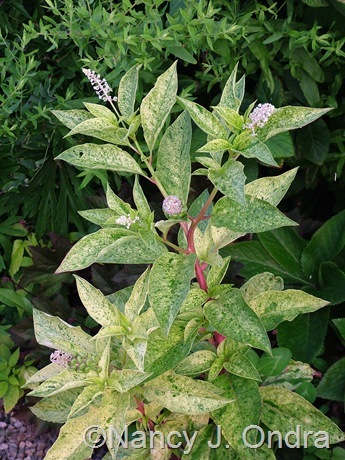 Phytolacca americana ‘Silberstein’ (variegated pokeweed): I’ve noticed that when anyone asks on gardening forums about growing variegated pokeweed , they get lots of negative responses – from people who have never actually grown it. For me, at least, it’s been distinctly less vigorous than the species, reaching just 2 to 3 feet tall and often getting crowded out by bigger perennials. I’m always glad to find a few self-sown seedlings each year for replacements. 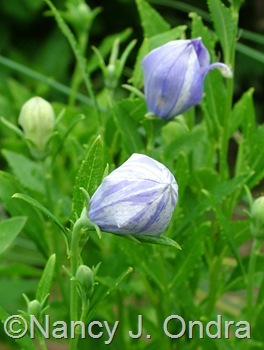 Platycodon grandiflorus ‘Axminster Streaked’ (balloon flower): The photos say it all, really. I’ve had some seedlings turn out to be the usual solid purple-blue, but nearly all have some mix of that color with white. 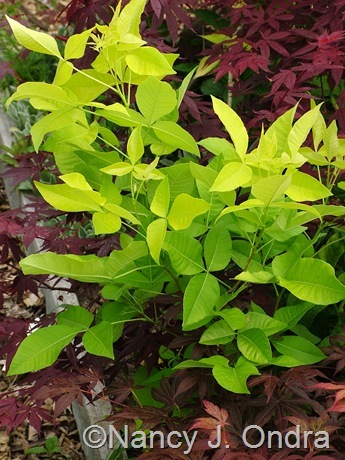 Ptelea trifoliata ‘Aurea’ (golden wafer ash or hop tree): An interesting golden-leaved tree that comes at least partly true from seed. You can read more about it here: Three Neat Plants. 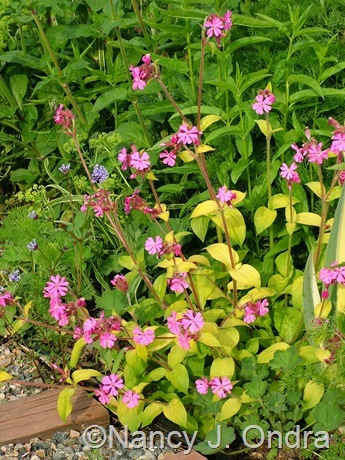 Silene ‘Ray’s Golden Campion’ (campion): A form of Silene dioica with bright yellow foliage and seriously pink spring flowers. Acts like a short-lived perennial here. Some of the seedlings are solid green and can quickly smother the slower-growing golden ones, so prick out the green ones early on if you want to keep them too or else snip them off at the base. 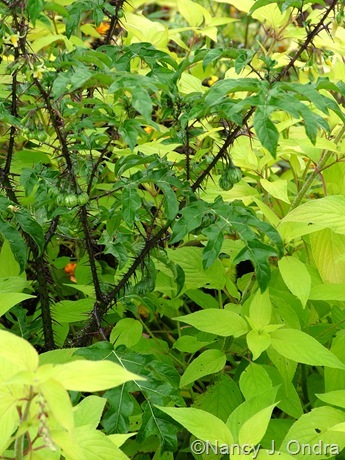 Solanum atropurpureum (malevolence, purple devil): You saw the round, golden fruits earlier in this post. 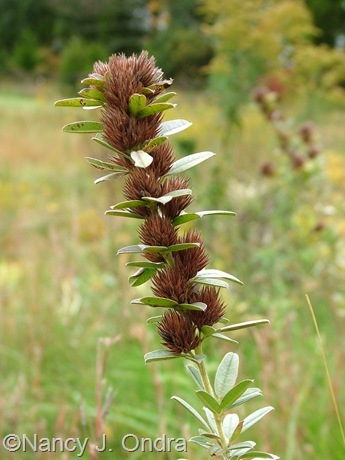 To read more about the plant, go here: Three Neat Plants. Talinum paniculatum ‘Kingwood Gold’ (jewels-of-Opar): Not ‘Kingswood Gold’, as so many sites refer to it; it’s originally from Kingwood Center in Ohio. 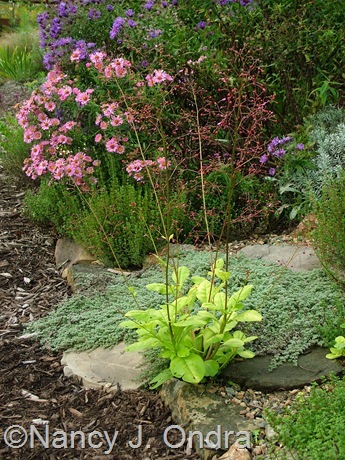 An easy annual with succulent chartreuse foliage, plus tiny pink flowers that mature into equally tiny, orangey seed capsules; usually about 1 foot tall. 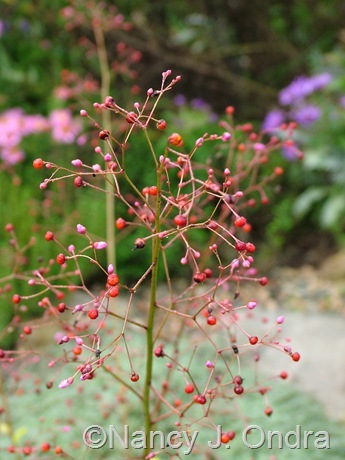 Tinantia erecta (widow’s tears): You can read about this unusual annual in this post: Three Neat Plants. 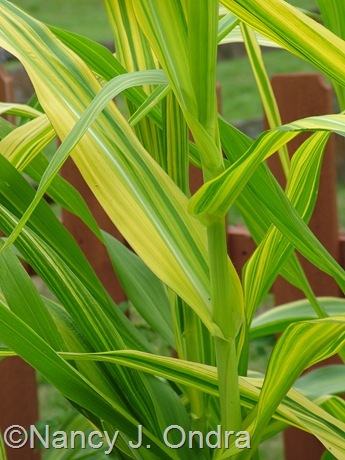 Zea mays ‘Tiger Cub’ (‘Tiger Cub’ corn): A dwarf ornamental corn (to about 3 feet tall) with bright white stripes on the green leaves. 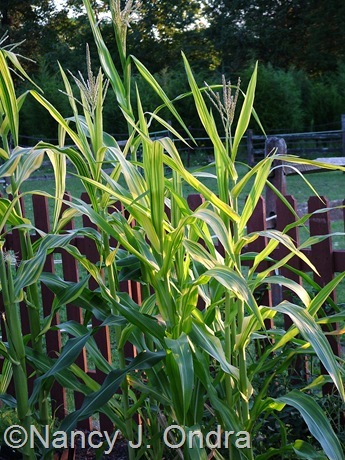 Zea mays ‘Old Gold’ (‘Old Gold’ corn): A tall field-type corn with yellow-striped leaves. If you’re interested in trying any of these, put together your wish list and leave it in a comment below or email it to me at nan at hayefield dot com. Feel free to ask for as many different kinds as you want, listed in order of preference (with those you want most at the top of the list). If there are many requests for certain seeds, I’ll fill them in the order I received the requests. The deadline for requests is November 28, 2011. I have two requests, in turn. One is that you send me a self-addressed, stamped envelope (I can give you a rough estimate of the postage once I get the requests worked out) to receive your seeds. The second is that next year, you collect at least one kind of seed from your own garden and share it with at least one gardening friend. It doesn’t have to be from the seeds that I sent you, though I’d be thrilled if it were, because these plants deserve to be more widely distributed and appreciated. My real goal is to show you how fun it is to collect and swap seeds of whichever plants you like best. I’ve never attempted an open offer of seed like this before, so I hope you’ll all be patient with me and not too disappointed if I can’t fulfill all of the requests. I promise to try to send you something, even if it’s not your first choice. 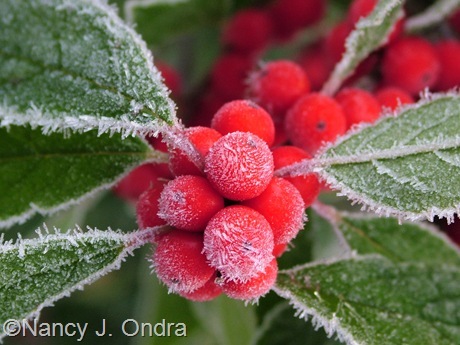 If you’re longing for even more neat seeds, you really need to join the Hardy Plant Society/Mid-Atlantic Group. To get an idea of the fantastic selection that HPS/MAG members have access to through their annual seed exchange, check out last year’s catalog here: 2010-2011 Seed Exchange Catalog. The listings change each year, depending on what’s been donated, but you’re always sure to find something of interest. I’m interested in: Eucomis, Talinum, Gossipyum seed. Put me on your list! Oh Lordy – where to start?! I would desperately love some of the black cotton. 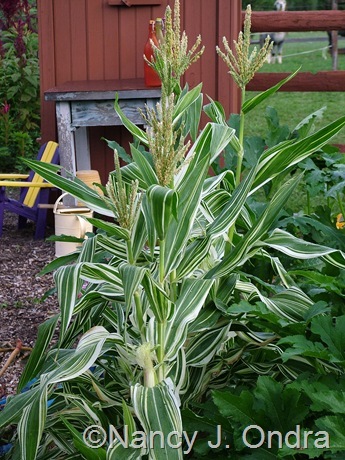 Plus Tiger Cub corn, Golden Wafer Ash, and the Eucomis. I’m in New Zealand – a bit tricky I know, but I’ve checked and there are ways to make this happen without getting into trouble. Please email me with your thoughts! I’ll e-mail you now, Kerry. 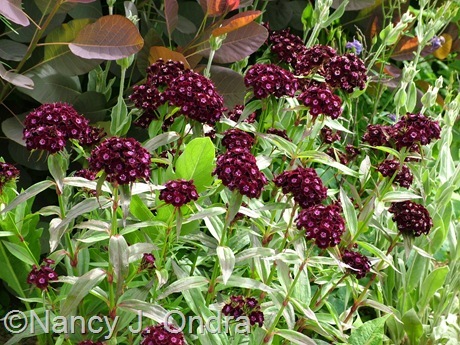 *I only want Cramer’s Purple if you think that its seed pods will still look good around the first week of August. (I can deadhead until a certain point to encourage that, right?) I’m crazy enough to be doing my own flowers for my wedding, and I would love to use those seedpods in the arrangements, since my wedding colors are red and purple. 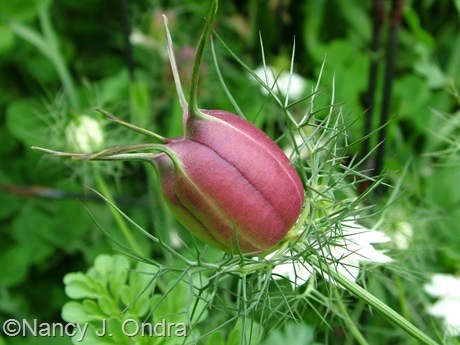 I can’t tell you exactly when the nigella pods will be around; it really depends on when you sow the seeds. I’ll try to figure out what the right timing might be for you. I’ve never tried deadheading it, but that could be a good tactic if the pods come along a little too early. Sorry to tell you that I should also be able to provide plenty of amsonia! But I try desperately Coleus Sedona, that here in Italy is not in the nursery. I wanted the cuttings, but I know that is impossible so far so I wonder if you can have at least the seeds of Coleus Sedona? Hi Romina. Unfortunately, all of my coleus died when the snow hit at the end of October. 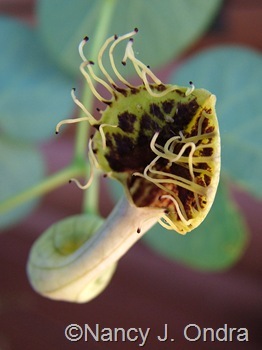 And now that I think of it, I kept the flower buds pinched off, so there probably weren’t any seeds. And if there were, the likelihood of the seedlings looking like the original plan was probably slim. So sorry I can’t help; it really is a gorgeous plant. What are you looking for, Romina? as I said I try the Sedona, in the spring when I’ll know where I can find it or if you can get me the seeds I thank you. Unfortunately here in Italy I can not find it. Oh, I’m sorry, Romina; I forgot about your earlier comment. As I said, my plants usually don’t set seed, and if they did, it’s very unlikely that the seedlings would look anything like the original plant. Thanks … but if I could somehow know where I could find it, thank you. Thanks, Sue. I’ll be in touch by email. Eucomis comosa sometimes squeaks through the winter here, but not the purple-leaved ones. (Well, I tried only once, but I can’t bear to risk it again.) My first attempt at growing it from seed has taken several years. I hope it will flower next summer (year 5). It probably would have reached that size a year or two sooner if I’d given it more attention. New to your posts. Every photo is stunning and love the descriptions. 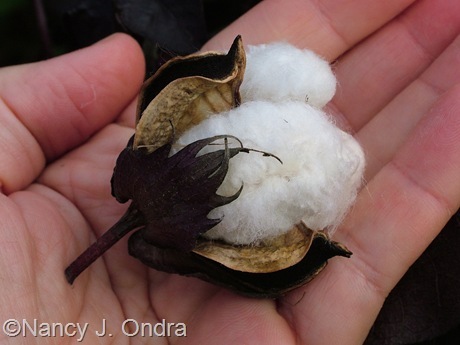 Interested in black cotton seeds. Do you do any speaking engagements? Hi Sandi! I’ll add your request to the list. Thanks for asking, but no, I don’t give talks. So many lovely photos and so many lovely plants, the only one I have is Eucomis comosa ‘Oakhurst’ which I hope will survive the winter. We have had 2 terrible winters, so I do hope it will be a normal one this year! 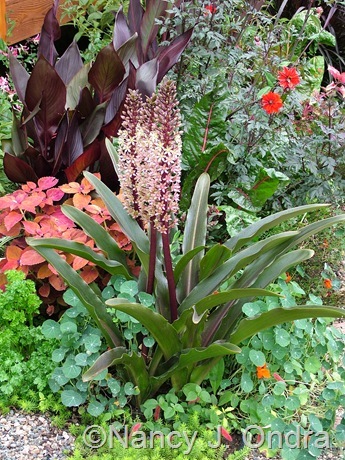 Hi Susie – Maybe you’d want to bring in the Eucomis bulb, as you do your cannas? I find it very easy to overwinter. I will gladly pass along seeds to my gardening friends. Hey there, Melanie. I’m afraid I don’t have all of those – just the ones listed in the second half of this post. I will put your requests for those on the list. No problem! Seeds get me excited too. I may be able to get you a few of your other requests; I’m heading out to the garden to see what I can scavenge before the rain starts. I’ll be in touch in early December. 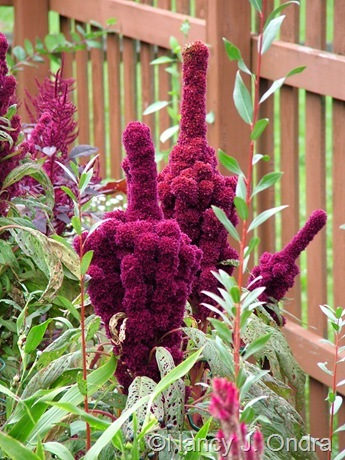 BTW, that amaranthus looks like it’s giving us the finger! I’ll bet that brings out a chuckle in any visitors! Chuckles, yes, and titters behind hands, too. It seldom fails to get a reaction from anyone with any sense of humor. Hey, stranger! You’re on my list! I was struck by the beauty of patrinia years ago on a visit to the Carolinas, but I have never been able to find plants in my area. (Lancaster, Pa) I would love some seed if you have plenty to spare, and I’d appreciate any tips for good germination! I absolutely love your blog and check it often to see if you’ve added a new post. Thanks for your generosity! I’ll make sure you get some seed, Carolyn. Thanks for being a loyal reader! I am from western Pennsylvania and just love you blog! Hi Paula. I don’t have seed available for all of those (I didn’t collect from the meadow plants), but I’ll put your requests for the others on my list. Thanks for getting in touch! Oh, my gosh, Nan, you’ve made my day! What an incredibly fun and generous offer. Glad I could brighten your Monday morning, Denise. I’ve added your requests, and I’ll be in touch! In the past year a field near a playground [I swore it was going to be a community garden, of course it isn’t…] was built up as a baseball field. It hasn’t been used – EVER. There is a lovely sign though, telling people not to walk in the grass. Whenever I walk my dog near there, I scatter seeds around the parimeter. 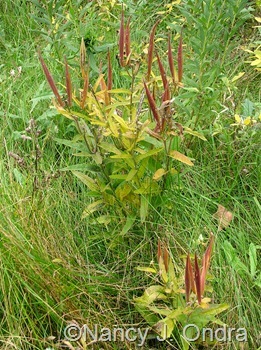 It’s currently a mass of Goldenrod [lovely! ], Pokeberry [striking! ], tall reed-like grasses, and Ragweed [Boo! Hiss! ]… I threw a buncha Butterfly Weed, Sea Oats, and Liatris into the mix though… I am hoping my walk next summer will be more beautiful! I will leave my list here, if things aren’t available I will not complain at all, frankly, just you offering these is reward enough! 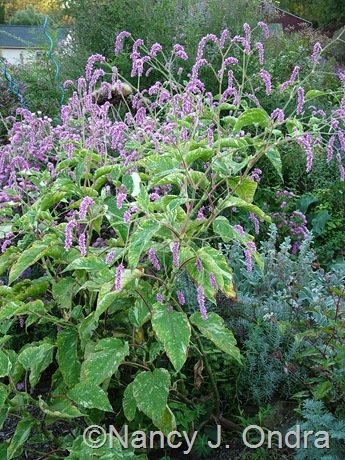 Phytolacca Americana, Gossypium Herbacena, Amsonia Hubrichtii, Patrinia Scabiosifolia, Eucomis Comosa. 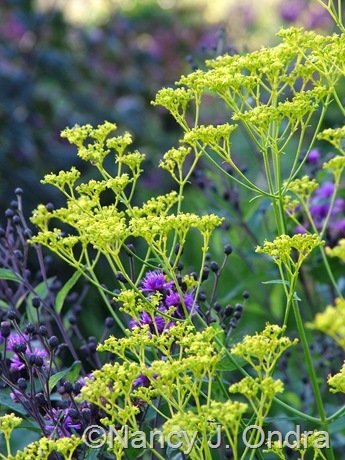 Again – I don’t need too many of each seed either, just you offering these is exciting enough! Let me know if this request can be done, and I will send out an envelope… today! Hee hee! And of course, Thank YOU! Hey, Donna – I’ll be happy to send you as many of these as I can. No need to send an envelope just yet; I’ll e-mail you when I get all the seeds divided up. Have a great day! If I lived near you I’d get in my car and drive over and squeeze you right now!!! I would like Amaranthus ‘Elephant Head’, Datisca cannabina, Dianthus barbatus ‘Black Adder’, Eucomis comosa ‘Oakhurst’, Gossypium herbaceum ‘Nigrum’, Nicotiana ‘Ondra’s Green Mix’, Patrinia scabiosifolia, and Zea mays ‘Old Gold’. Heh – you’re sooooooooooo welcome, Shelley! All excellent choices. I’ll be in touch in a few weeks. 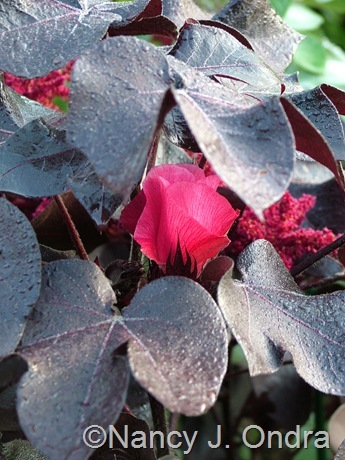 my best friend will be absolutely ecstatic if i could give her some of the Gossypium as a Christmas present! she’s the nicest person i know (seriously the sweetest!)! we both work for our municipality as gardeners and constantly pass along seeds, cuttings, and plants to anyone who shows interest. here in toronto, we both regularly visit the front yard garden of the wonderful artist, vivian reiss, and my lovely friend has been searching high and low for the fabled ‘black cotton’ ever since hearing about it from vivian. i’ve got to run, and didn’t even have time to read the rest of your post, or pay attention to what other seeds you have… i’ll have to take a closer look tonight. but please, please add me to your list for the Gossypium! I’ll do my best on the cotton, Lisa. If you want to add others, let me know! PS I started the red plantain you sent me and the squirrels dugs them up…grrr! I will start some more in the spring. You’re in, Kate. Sorry to hear about the squirrels. I wish you better luck in the spring! funds, I have been collected starts and seeds everywhere! Yours will be the crowning touch! Thank you so much!!! My little boys helped me collect cosmos seeds this year, from plants that had reseeded from the previous year….they are a little different every year and that makes it so fun! Seeds are a big help for us low-budget gardeners, aren’t they? I’ll email you in a few weeks, Katie. 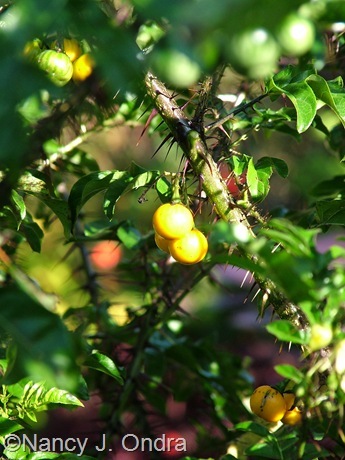 I should be able to send you several of these, Alison – the Solanum, for sure. So far, you’re the only one brave enough to ask for it. left I’d be very happy too. I’m doing a happy dance right now! Hi Britta! I think I can get you the first two, at least. I’ll be in touch when mailing time comes. No problem; I have you down for ‘Tiger Cub’ now. What a generous offer, I can’t believe you’re not already flooded with requests! I would be happy with any of the following… actually just the offer has made me happy! Thanks again, this is pretty cool! Hi Frank! There really are a lot of seed-crazy gardeners here; you’re seeing only about 1/3 of the requests here. But I still have plenty of many of the seeds – especially the malevolence! You’re on the list. Nan, you are a very special person: we appreciate you! Hey there, John. I’ll be able to get you many of your choices. I’ll be in touch when they’re ready! That’s great, Kathy- welcome to HPS/MAG! You’ll be really glad that you joined. And yep, I can get you some seeds. I’m really not good at talking in front of people. I was thinking that an ebook, maybe with quick videos showing how to collect and clean seeds, could be fun, though. Thank you so much for visiting. I enjoyed looking at your blog too! Thank you so very much; I do enjoy collecting seeds of plants I especially enjoy and think others will, also, and have shared some this fall. Thanks, Donna! Yep, I still have seeds available and will put your requests on the list. I’ll be in touch soon. 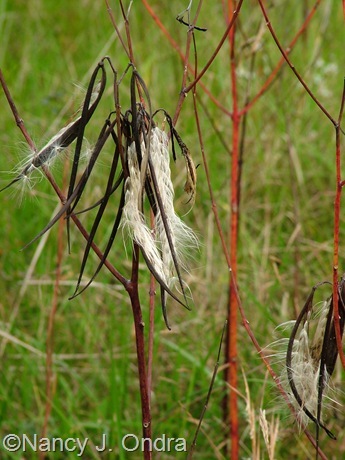 I would like to have some Arkansas bluestar seed to compare the plants with the one I have that was dug from a pasture near the Gulf of Mexico. 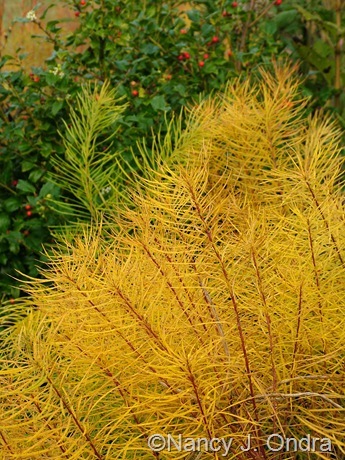 I would also like to have the Kingwood gold jewels of opar to compare with the all green variety that I have had for many years (and have shared the seeds). Thanks for writing, Sarah. I’ve put your requests on my list. I have a US box address you can send to and I can also mail you postage. I’d love the cotton, malevolence, jewels of opar and anything else you have that you think should grow in the sub tropics. Hi Nicole! I’m adding you to the list. I’m pretty hopeless starting things from seed, but I wanted to pay a compliment to your blog. I am new on the “garden blogging” scene and the quality of your blog is something I aspire to. Do you take your own photos? They are absolutely gorgeous! Welcome to the ranks of garden bloggers, Mary. Thanks so much for the compliment. Yes, all of the photos are mine, taken here at Hayefield (except for the few noted otherwise), with a now 7-year-old Fuji Finepix S7000 permanently set on Auto. 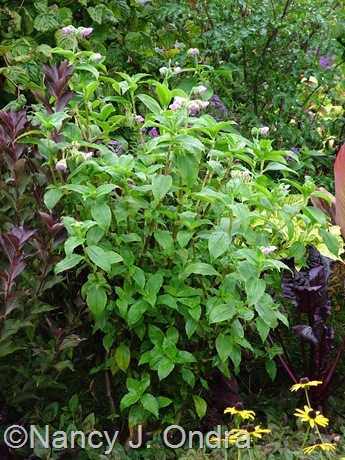 Nan–really enjoy your writing, and love starting things from seed.Request Ptelea, gossypium, and the amaranthus. What fun! Thanks so much, Bruce. I’ll be in touch. Nan, What a generous offer~I am tempted by all of them, but know that with limited space and sun I’ll stick with a few! 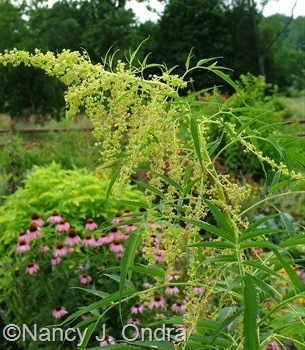 Nigella damascena ‘Cramer’s Plum’ (love-in-a-mist), Phytolacca americana ‘Silberstein’ (variegated pokeweed): Amaranthus gangeticus ‘Elephant Head’ (amaranth) makes me laugh with delight! and red spider zinnia. Thanks, gail and I am sighing over the photos and combinations! Great choices, Gail. I’ll email you. Nan: You grow so many choice and unusual plants. I love that Amaranthus g. ‘Elephant Head’ which does make quite a statement and all the persicarias are interesting. Whatever seeds of those you can spare, I would love to try. Hmmm…do I have anything interesting to offer you? You will have to come to the garden and choose whatever you wish! No trade necessary, Layanee. I’ll be in touch by e-mail. 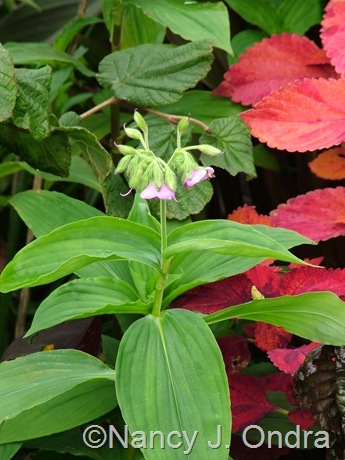 I was just reading that Talinum is a tender perennial. I tried it for the first time this year (‘Limon’), and before I moved it to its summer home, I had it in a container in the gravel area, where it self sowed. Early in autumn, I dug up one of the seedlings and put it in a container to replace the original plant. On a whim, I decided to bring the little plant inside for the winter (this is when I thought it was just an annual). I’ll let you know if it makes it through the winter under my benign neglect. I stink at seed starting, although I seem to have some success with outdoor winter sowing, so if you have any seeds left of the Patrinia and Persicaria ‘Shiro-gane Nishiki’ I’d love to try them. I’ve managed to collect some seeds from the plants I grew from the Ceratotheca triloba alba you sent a couple years ago. Thanks for them and for offering even more seeds. 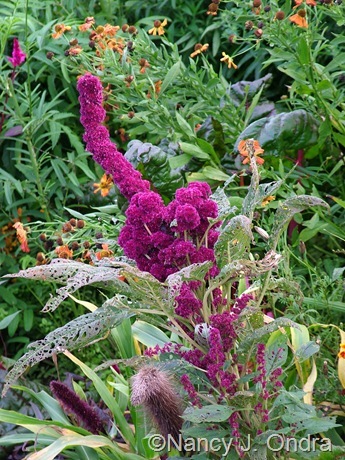 BTW, that Amaranth looks like it’s flipping somebody off. I’ve seen references to the Talinum as a houseplant, so I’m guessing that it really is a tender perennial. I prefer to treat it as a self-seeding annual; much easier to keep that way. I’ll be glad to share the seeds you asked for. I love these three and are adding them to my list to plant in my own garden next year! 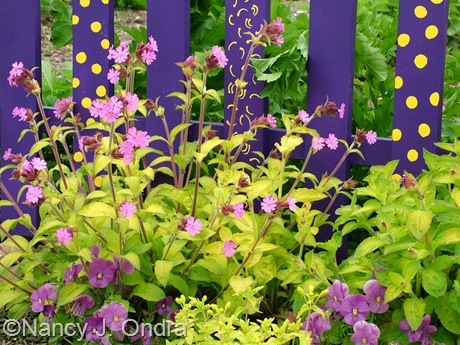 Question: Do you prefer planting perennials in the spring or fall? I’ve heard of doing both. Good question, Adam. My own approach is to plant them whenever I find a space for them and have time to get them in the ground. That usually translates into April and September, but it can be pretty much any time the ground isn’t frozen. Nan, I’m here at Gail’s suggestion and like her, I’m all aflutter over the photos and plants! I’d love seeds for Nigella, Platycodon, Dianthus, Amsonia, and Nicotiana. I’d be happy to return the favor and send you seeds from my corner of Katy, if you’re interested. We’re two vastly different climates but I’ll bet I have at least 2 or 3 plants you could grow! I’ll add your requests to the list, Cindy. I really appreciate that, hb. And yes, the internet certainly has been a boon for us gardeners: we get to see gardens we’d never otherwise be able to visit, we can easily compare the progress of our growing season with others, and we can find out about great new plants to try. I’ll be in touch, Lisa. 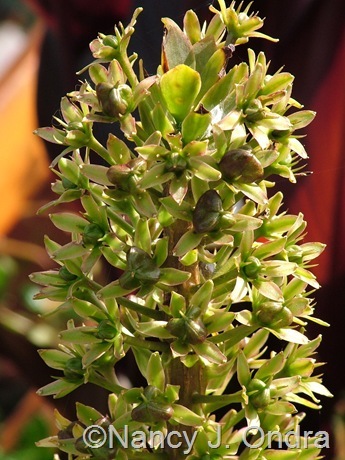 I’d guess it’ll take 4 to 5 years for the Eucomis to flower from seeds; maybe less if you took really close care of it. You are so very generous. I am interested in the two types of corn, Zea Mays ‘Tiger Cub’ and ‘Old Gold’, if you have any to spare. Can do, Carol. I’ll be in touch. It’s so great to see people taking more interest in the seeds and fruit of their plants, including their perennials. 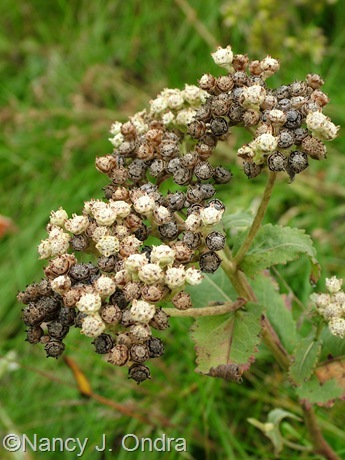 While I don’t have many of these species in my garden, I do leave seed heads on plants as long as I can (to let the birds eat them, give winter interest, etc). I’m glad to see you enjoying Patrinia as much as I do. A nurseryman gave me several plants last year and it’s slowly but surely expanding. 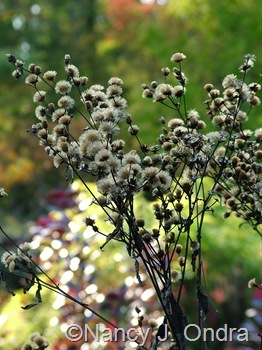 Love its fall colour and elegantly relaxed flower heads. I continue to point people to your books, especially Fallscaping, Nan. Thanks so much, Jodi. I’m really happy to hear that you were able to get patrinia from a nursery, and that it’s performing well for you up there. And yes, it’s super to see the excitement about growing from seed! I have been lurking and enjoying your posts for over a year now and have been passing the link on to anyone else I know who would enjoy it too. Your garden is so inspiring! Pretty funny, but I actually asked on a garden forum I frequent about the variegated pokeweed and nearly all the replies I got were from those who were growing/trying to get rid of the plain green leaf species. Only one person truly grew the variegated form. Thankfully I ignored all the ‘negative’ postings and got some seed of the variegated poke in a trade anyway. ;-] I first saw this beauty on one of your posts and truly fell in love! Hopefully it will do well here. I know I am a bit late here, but do you have any more seed available? I am very interested in your: Zea mays ‘Tiger Cub’, Zea mays ‘Old Gold’, Silene ‘Ray’s Golden Campion’, Gossypium herbaceum ‘Nigrum’, and maybe ‘Eucomis ‘Oakhurst’. It’s my pleasure to have you as a reader, Christin, and yep, I can send you most of those seeds. I’ll be in touch. My friend Shelley told me about your website a couple of months ago and I have been drooling over your gardens ever since. I’m out of the Ptelea and Eucomis for this year but can send you the rest, Stacy. I’ll be in touch by e-mail. I missed the seed offer. drats, However, I didn’t miss Fallscaping – loved the book. Just great. I have a novice question…How do I know when the seed is ripe enough for removal? Is there a good book you could recommend on seed collecting? Thanks. Hi Jeannie – I don’t know of any books specifically about seed-collecting for ornamentals, but I can give you information on specific plants. I’ll email about that and about the seed offer (I still have some left). Hi Scott! I should have already written another post by now, so I think I’m the late one. 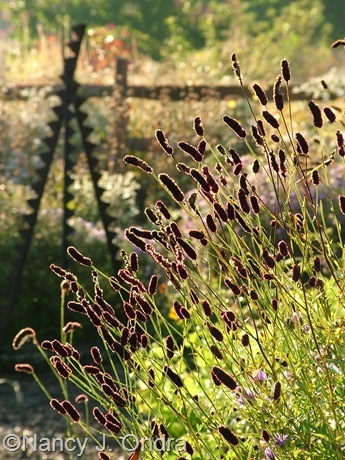 My gardens are all pretty much cut down now; I’ll have to enjoy seedheads vicariously this winter. I hope your vernonias are in full fluffy glory soon. wonderful plants, generous offer, but I live in Australia and sending seeds through the mail is seriously prohibited as far as I know. Thanks for visiting, Catmint. Maybe you can set up some sort of seed swap for gardeners in your own country? I’ll be in touch about the seeds, Stone. And it happens that I already did a post about seed packaging a while back. You can find it here: Origami for Seed Savers. Thank you Nan, I look forward to seeing surprises in the mail. I’d like to comment on a coupla of your pictured plants. 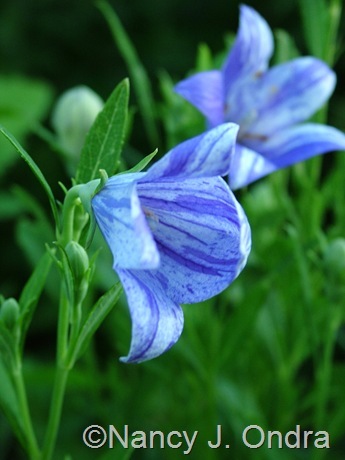 Your “purple devil” looks like a horse nettle variety. 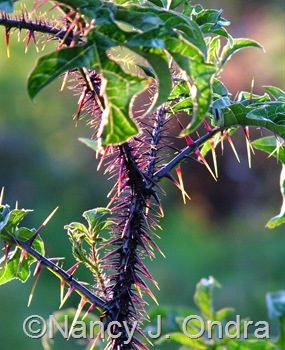 I’d be afraid of setting it loose… If you like that kind of thing, I could package you some Cnidoscolus stimulosus. 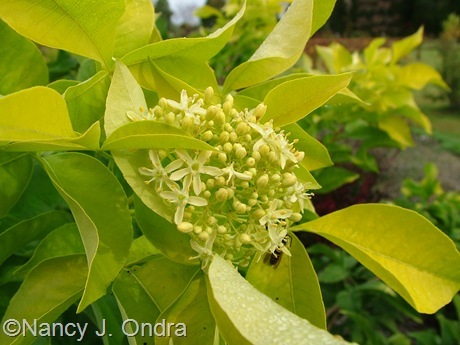 Your Ptelea trifoliata kind of resembles Desmodium before it blooms. ‘preciate the link… will try to do something with the info. You’re very generous, Stone, but I think I have more than enough spiny stuff around here, most of which I did not plant. And that’s an interesting observation about the Ptelea. You should see the seedlings: they look for all the world like bright yellow poison ivy.